I picked up this rifle on gunbroker a while back for around 900 bucks. It said it was new in box but it obviously had at least 40rds through it and the brake is aftermarket so I guess they meant it is "fairly new, in a box". It already had the 20moa rail and clamp on brake so it seemed like a good deal anyway so I kept it. Finally I had some time and money to put a scope on it so I thought it would be good to get/make some ammo for it so I can shoot it! Since this is my first rifle in 300 win mag, I had to buy all the reloading gear as well. I decided that I will just try neck sizing at first so I just bought a rcbs set with neck size and seating dies. Generally I just use the large Lee cutter with lee case gauge as it only runs about $6 bucks for the gauge and shell plate if you already have the cutter. If you have to buy the whole thing, its probably around $15. So the reloading equip ran me an extra $40 bucks but I still needed to get some brass to reload. I have always had good luck with Partizan PPU and I knew they made it for 300wm so i decided to pick up a few boxes of that for starts. I found some 165gr for about $18 a box online so I bought 3 boxes to start. 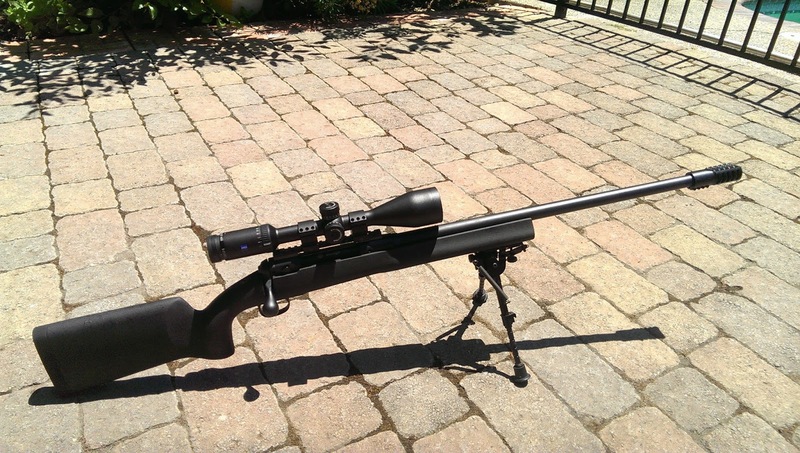 I put this Zeiss HD5 5x25 scope on the rifle which is pretty good glass and is made to stand up to the magnum rounds. The reticle is really made for a 308 so I may switch it out with the scope on my r700 later on. After cleaning the rifle, torquing down all the screws to the recommended weights, I was off to the range to "make some brass". I had read some good reviews on the 165gr PPU so I had high hopes for the factory ammo. Unfortunantly after firing 20rds, it was clear to me that I was going to need to reload if i had any hopes of accuracy. Sure, the gun is new and not broken in yet, but I was seeing 3" - 4" groups at 100 yards. As an fairly experienced shooter I was pretty sure it wasn't me. The groups were also moving which was quite concerning as well. Still it was too early to judge on this rifle so I blasted away the 60 rounds I bought and got the barrel real hot. I did run a patch or two through after every box but I am not from camp that believes you should clean a new gun after every few shots for the break in period. The brake on the gun made shooting these rounds almost a pleasure. In fact other than the noise, this thing felt like less recoil than any of my 308's. The brake is is a clamp-on brake from Witt Machine http://wittmachine.co. Real nice peice of work. All in all, this gun is a lot of fun to shoot but I need to work on the accuracy part. Hopefully it gets better as it breaks in. Also noted that I am going to have to put a cheek rest on it so I can get a consistent weld. More on that later.